HOLLAND OH (HJ) - High school senior Cheryl Heft of Toledo, Ohio was saddened, but relieved to find out that she did not have the mystical power of “The Force” while touring in Italy. Cheryl spoke to us from her hotel in Florence, Italy where she and her classmates were spending the evening. Her class was on the fifth day of their overseas European trip when they made a stop at the historic Leaning Tower of Pisa in Pisa, Italy. 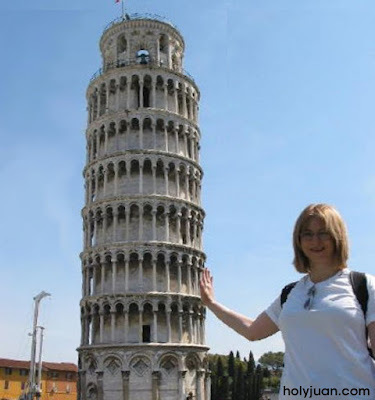 “My friend Elisa had just posed in front of the Leaning Tower and then it was my turn. As I put my hand up, I, you know, felt a like a weird sensation. Elisa said, ‘Oh my gawd’ and I turned to look at the tower was straight! At first I thought it had to be some kind of a binding, metaphysical and ubiquitous power.” What Cheryl actually felt was a very strong aftershock that rocked the western coast of Italy. This 4.6 magnitude earthquake tipped the Leaning Tower back up and perpendicular to the ground.